Out of all the continents, Europe is the one that I have travelled the most (living in Scotland helps! What doesn’t help is the fact I have to take at least 2 planes to get anywhere…). I’ve decided to make a list of my Top 20 European Destinations. Some of these I’ve been to, some I’m desperate to visit but I hope you enjoy my list! Just a head’s up, this list isn’t in order of how much I like the destinations, as they’re too amazing to put in order! If you wanna pretend you’re in Game of Thrones (although, you’ll probably end up killed off like the rest of the characters…), then this is the destination for you! Dubrovnik is a beautiful, old town, full of amazing history and museums. The world’s second smallest country (after the Vatican), Monaco is one of the glitziest places in the world and I badly want to visit it. It’s very expensive, though! I’m desperate to visit Barcelona and see the Sagrada Familia, get lost in the alleys, and enjoy everything Gaudi! One of the most beautiful places I’ve visited, Prague is full of amazing architecture, history and everything is so cheap! And you need to try a trdelnik – they’re so good! Full of brilliant museums, Amsterdam is also famous for its biking, culture and history. Budapest is probably up there for culture and architecture. And I’ve heard it’s a good place to travel to if you’re on a budget. I love Verona. It’s so small, cute, rustic and full of history – and it’s so easy to get away from the crowds as well! I love anything to do with Ancient Greece, so what better place than Athens? 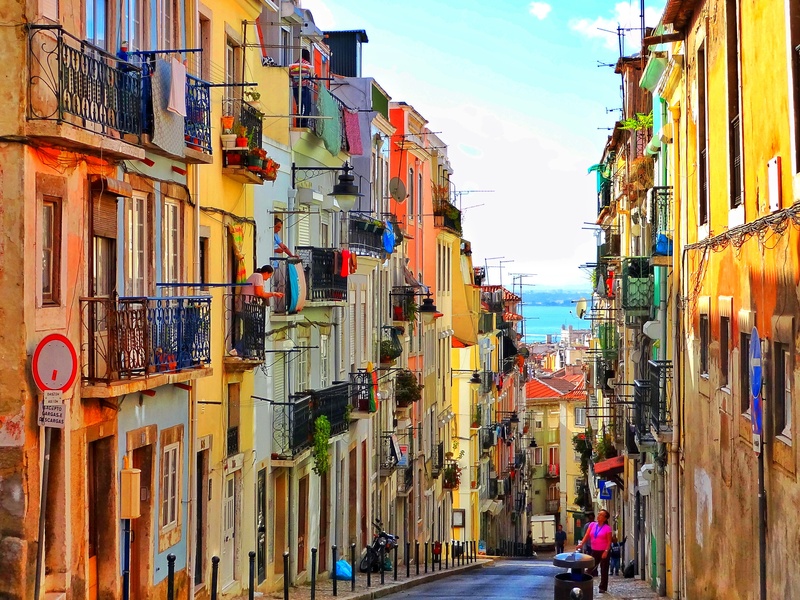 Lisbon is up there as one of the places I’m probably going to visit soon (fingers crossed!). This beautiful city is full of amazing culture, great food, and gorgeous, tiny streets. I badly want to visit this cliffside village – imagine the views! And the history of the place is amazing. The romantic City of Lights, there’s so much to do in Paris – amazing nightlife, culture and food, to name a few! So many castles! I need to go here! You’ll recognise the pictures – the gorgeous, white buildings with blue roofs. I’ve also heard the sunsets are amazing. I love Venice. It’s so unique and unlike anywhere I’ve ever been before. It’s impossible to walk over a bridge and not take a photo of the canals. As well as the history and the amazing architecture, Seville is also famous for tapas, flamenco and sangria. Five gorgeous, small towns by the coast. Hike or catch the train between each town. Be prepared, though – there’s not a flat area anywhere. It’s all hills or stairs. My first ever all-inclusive holiday! I’ve never been on one of these before (although, I have been on a half-board holiday). I went with two friends (and it happened to coincide with my 25th birthday, which we hadn’t planned but it worked out 😀 ) and we managed to book a really nice, cheap place through Thomson (it worked out at around £400 each for the four days that we were there). So, because I seem to think I need to take the kitchen sink with me, I packed my suitcase chock full of stuff that I wouldn’t even use. At least half of my outfits weren’t taken out of my suitcase. I was away for four days and I packed three (three!) pairs of sandals. Why would I do that?? Anyway, since I seem to be so disaster-prone, I was sick on the plane on the way there. I don’t know why this is suddenly happening to me. First Prague, now Ibiza. I’ve never been sick travelling before, so I really hope that this isn’t going to be a regular thing. It was horrible – the toilet was busy, so I actually had to use a sick bag (ugh…). Thankfully, the only good thing to come out of it was that one of the friends I was travelling with hadn’t even realised that I’d been sick until my other friend and I were talking about it at the hotel. So, that means I was quiet right? I wasn’t that passenger…was I? Moving on! After that incident, I felt fine! So, we arrived at the airport, grabbed our suitcases and boarded the bus. Luckily, we were the first stop and, even though we were about five minutes from the airport, the planes flying overhead barely made any noise. Once we’d checked in, sorted ourselves out and got our towels from reception, we headed to the pool. And that was pretty much how we spent the next four days (I told you guys, I’m not a very experienced traveller). In the evenings, we did go exploring, which was lovely. We walked up to Ibiza Castle. It was really nice, even though my body thought the steps were really confusing. They were super wide and on quite a slope. My friends had fun watching me trying not to fall over backwards. I know Ibiza is meant to be a party island and my friends and I aren’t the biggest party-goers but we were excited to experience it. However, we’d booked it in October and we didn’t realise until we arrived that all of the clubs were closed. We managed to make it to one closing party – in an Irish bar – so that was something. It’s gives me a reason to go back!